Happy Women’s Day to all moms, wives and house wives out there, and also to all the engeneer, programers and entrepreneurs. For your beauty, tenderness and delicacy, but also for your professional competence, decision making skills, assertiveness and strength. Congratulations to the married, single and divorced women, mothers or childless, straight, homosexual and also to those who became women during their life. To all of us, congratulations for our day. A day to celebrate and remember that we are and shall always be free to live however we wish. Free from beauty, behavior and relationship stereotypes, free from sexist traditions and from violence, free from discrimination on the workplace. To remember that there aren’t such things as “women’s thing” nor “women’s place”, nor any gender limitations. 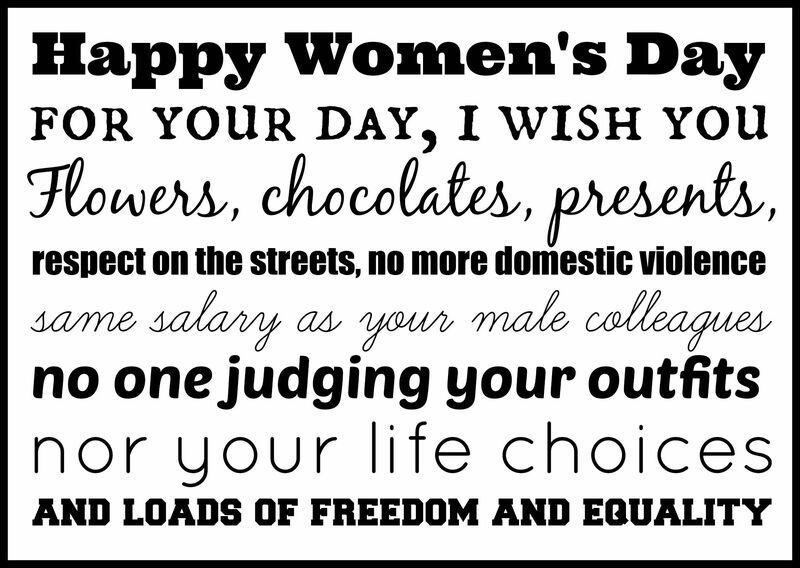 Let us receive flowers, chocolates, compliments and cards, but let us not be satisfied with it and continue to demand and fight every day for our right to freedom, equality and respect, no matter the size of our skirts, our relationship status, our profession or who we go out with. PS: Liked the card? Click here to download it and send it to the women in your life!